1 of 2 Halve, pit and peel avocados. Mash avocados with fork in medium-size bowl with lemon juice, salt and pepper until well blended. 2 of 2 Stir together the sour cream, mayonnaise and taco seasoning in a small bowl until well blended. 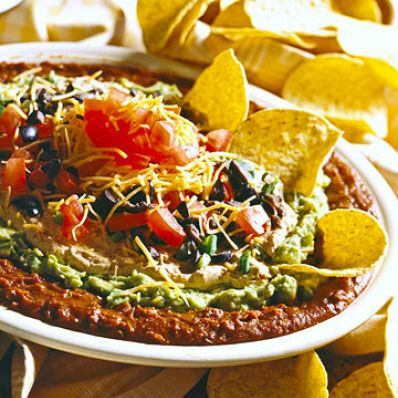 1 of 2 Spread the bean dip over a large shallow serving platter. Top with the seasoned avocado mixture, spreading to the edge but leaving a little of the bean dip showing around the edge. Spread the sour cream mixture in an even layer over the avocado mixture. Sprinkle evenly with the chopped green onion, then the tomato and the olives. Sprinkle the whole top evenly with the shredded Cheddar cheese. 2 of 2 Serve the dip chilled or at room temperature with a bowl of the tortilla chips on the side for scooping. Makes 24 appetizers. Per Serving: 17 mg chol., 15 g Fat, total, 5 g sat. fat, 515 mg sodium, 3 g fiber, 181 kcal cal., 9 g carb., 5 g pro.